Here, the subscript 0 denotes an equilibrium quantity. Perturbed quantities are written without subscripts. Of course, , , and are constants in a spatially uniform plasma. which has the associated eigenvector . This root is characterized by both and . It immediately follows from Equations (7.34) and (7.35) that there is zero perturbation of the plasma density or pressure associated with the root. In fact, this particular root can easily be identified as the shear-Alfvén wave introduced in Section 5.8. The properties of the shear-Alfvén wave in a warm (i.e., non-zero pressure) plasma are unchanged from those found earlier in a cold plasma. Finally, because the shear-Alfvén wave only involves plasma motion perpendicular to the magnetic field, we would expect the dispersion relation (7.42) to hold good in a collisionless, as well as a collisional, plasma. Note that . The first root is generally termed the fast magnetosonic wave, or fast wave, for short, whereas the second root is usually called the slow magnetosonic wave, or slow wave. The eigenvectors for these waves are . It follows that and . Hence, these waves are associated with non-zero perturbations in the plasma density and pressure, and also involve plasma motion parallel, as well as perpendicular, to the magnetic field. The latter observation suggests that the dispersion relations (7.43) and (7.44) are likely to undergo significant modification in collisionless plasmas. This can be identified as the dispersion relation for the compressional-Alfvén wave introduced in Section 5.8. Thus, we can identify the fast wave as the compressional-Alfvén wave modified by a non-zero plasma pressure. This is actually the dispersion relation of a sound wave propagating along magnetic field-lines. Thus, in low- plasmas, the slow wave is a sound wave modified by the presence of the magnetic field. Hence, and have the same sign if , and the opposite sign if . Here, is the phase-velocity. It is straightforward to show that , and . Thus, we conclude that the plasma pressure and magnetic pressure fluctuations reinforce one another in the fast magnetosonic wave, whereas the fluctuations oppose one another in the slow magnetosonic wave. Figure: Schematic diagram showing the variation of the phase velocities of the three MHD waves with direction of propagation in the - plane. Figure 7.1 shows the variation of the phase velocities of the three MHD waves with direction of propagation in the - plane for a low- plasma in which . 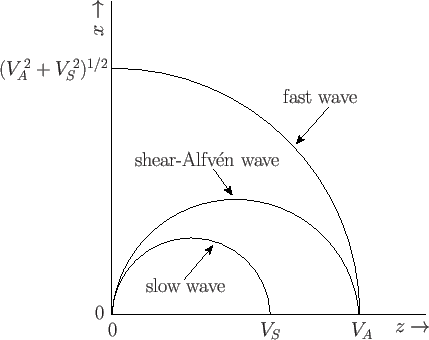 It can be seen that the slow wave always has a smaller phase-velocity than the shear-Alfvén wave, which, in turn, always has a smaller phase-velocity than the fast wave. The existence of MHD waves was first predicted theoretically by Alfvén (Alfvén 1942). These waves were subsequently observed in the laboratory--first in magnetized conducting fluids (e.g., mercury) (Lundquist 1949), and then in magnetized plasmas (Wilcox, Boley, and DeSilva 1960).